I've been mentally chewing on this recipe for a while now. 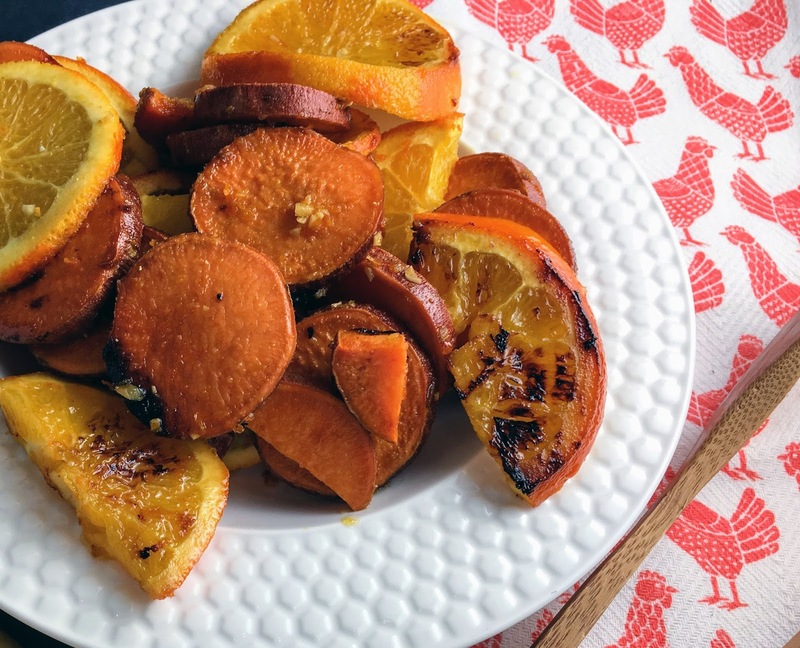 I knew I wanted to do something with yams and oranges ever since my mom told me that she secretly adds a splash of orange juice to her candied yams at Thanksgiving - sorry for spilling the beans, mom! Her candied yams are usually the highlight of the Thanksgiving meal for me, so I knew it would be a winning combo from the start. What I didn't know was what the heck else to add. I bought the yams and oranges and watched as they sat in sadness day after day until finally I knew I needed to use them or lose them. In the end I decided to add ginger and garlic to spice things up a bit, and drizzled the whole thing with honey to kick up the natural sweetness of the yams and oranges. It turned out looking gorgeous and tasting even better. 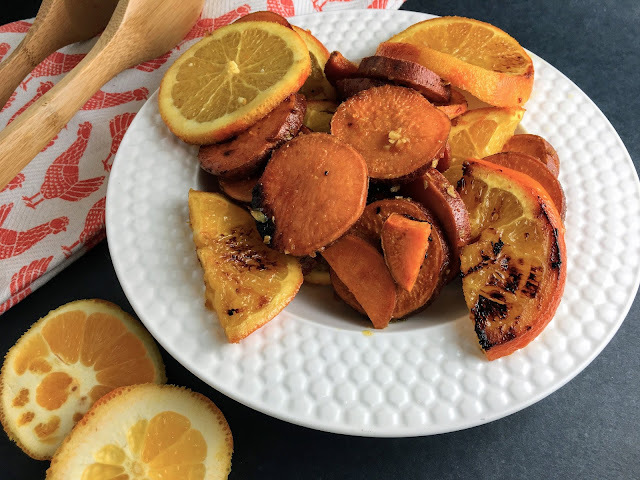 The sweet caramelization of the yams and honey mixed with pungent orange, ginger, and garlic flavors were spot on. Next time I might try adding some red pepper flakes for a bit of heat, or some cardamom for another layer of spice, or maybe I'll just leave it as is. It was pretty darn good. 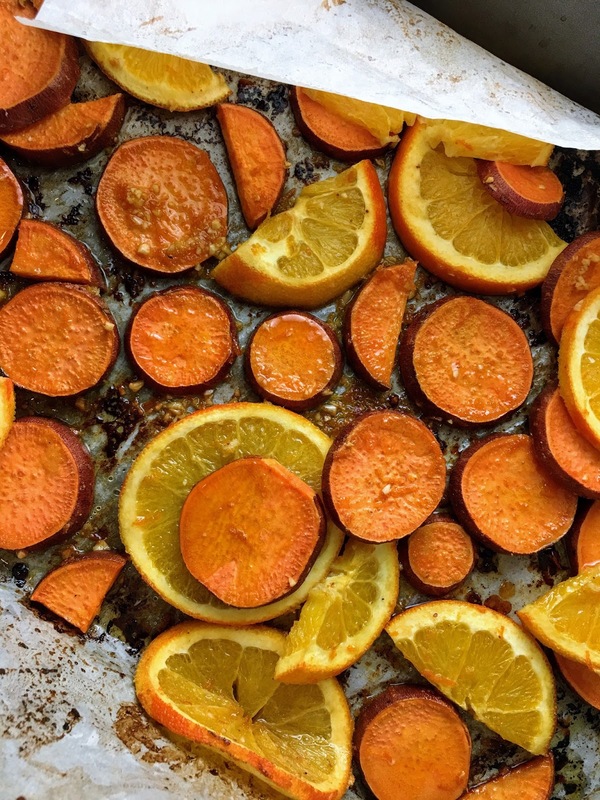 Start by preheating the oven to 425 degrees F. While your oven is preheating, zest one of your oranges (this should give you about 1 Tbs of zest or just under) and finely dice your garlic. Next cut your yams, the orange you zested, and half of your other orange into equally sized slices, probably less than 1/2 inch. I cut most of them into rounds because I think it looks pretty, but you can cut them into halves or quarters to fit more into the pan. Toss the orange and yam slices in a bowl with your olive oil, garlic, orange zest, salt, and ginger, then lay out as evenly as possible in a dark roasting pan lined with parchment paper. Give your orange a couple of squeezes over the top, drizzle with honey, and bake for about 25 minutes until sizzly and delicious. I recommend checking them at about 20 min to see if they are too dry. If so, you can add a bit more olive oil and honey and let them continue cooking for a bit. The bottoms will get much browner than the tops, so just make sure not to burn them. Serve with a little sprinkle of salt and another light drizzle of honey, and that's it! The oranges especially turned out so good. They gave such a nice compliment to the sweet yams and honey. I honestly didn't know how they would turn out; I knew they would add a great flavor to the yams, but I was a little worried they would become garnish. I was really pleased with how yummy they tasted. I can't wait to make this recipe again, and maybe try a few different things with it. If you give it a try let me know what you think!